Game of Thrones is the funniest fantasy show on TV right now. Grog House is different. Haha god that was a fantastic reaction to that scene. Unfortunately didn't shed any light at all on your project-- but it could get a lot of views on YouTube as one of those "reaction videos" that are so popular. I liked the concept of this vid, Im just not sure it was as well executed as it could have been. Overall though I find the show's concept to be quite funny and hope to see them in the next round of final 15. Though I did find the reactions of the lady in the piece as she watched Game of Thrones for the first time rather funny, I began to wonder if you plan to have us watch her watching other shows. I gather that's not the plan, but not sure why this is a differentiator. Excited about this one, really digging the "it's always sunny" set in middle earth vibe. A lot of shows seem to not know who their audience is and they suffer for it. I like the specificity of the premise and think there's a lot of opportunities for solid episode ideas. A clever video and original. Funny group of people. Good writing. Keep up the good work. Interesting to watch and look forward to see the new directions you take the videos in the coming weeks. Your Differentiator reminds me of the baseball commentator scene from Naked Gun. Two commentators watch a player get his head ripped off. One laughs appreciatively, while the other just gawks in horror. And while I'm still not entirely sold on the writing, I think you're all sitting (pardon the pun) on a very solid premise. Still pulling for this! That's a cool idea with potential. I think that fans of the Game of thrones and that kind of stuff will really enjoy seeing what these guys have to offer. Good luck. As much fun as the reactions to the Game of Thrones stuff was I wanted more about the show and it's characters and setting. I really like this one guys! Good stuff. Would love to see this keep going :) Very funny idea. Love the trailer, some great filmmaking. Real potential for some wacky characters. Nice work guys. Guys... i'm a geek - a huge geek. I love Game of Thrones and D&D and all that stuff. I gotta say I'd like to see your show with a budget. I think it would look great and could be really funny. Especially with the talent you guys have already. Best of luck to you! the beginning of week one video was pretty slow but the last 10 seconds or so had some good ideas. Hopefully it continues. Love it, love it, love it!!! If this were on at the same time as Game of Thrones I would have to give consideration to watching this first and PVRing Game of Thrones... And I love me some Game of Thrones. My inner nerd hopes you guys win this thing. I'd love to know more about the details of the show, not sure I'm seeing a season 2 yet. Although I felt like I got the tone of the show, and am a big fantasy nerd myself, I don't feel like I know much about the show or know much about its characters. Ah! That was really awesome. I wish you could hear/see a little better but the concept was awesome in this video. Must see more. The Game of Thrones bit was absolutely hilarious. Loved it. Also love the old-timey tentacle image. Great job! Reaction videos are definitely funny, but I would have really liked to have seen more of your actual show and for your uniqueness to be explained in that way rather than just end with a few clips from some of your past videos. Good luck guys! Yes! Nerd humour! Week #1 was a great sample and Week #2 showed off your writing, but Week #3 felt like something more could have been done with it. I'm looking forward to future weeks to see what you can really do. Good luck! 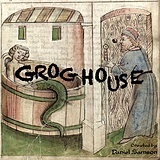 I like the idea of Grog House to the point where I'm worried by how much I like it. I’m curious as to where this idea came from! I like the concept, all of the brave warriors wizards are out fighting battles and these idiots are what's left. I'm interested to see where it goes.